Jim was showing me around, the first newcomer for over a year. The kids were high on the skeleton of a clock tower. There were two up there. Girls or boys, I couldn’t tell. Just squatting. Later, I climbed the tower myself. The gravel desert reaching out to the edge of the world. The track snaking away. The sun setting, huge, forlorn and dull through the dust. The above was written for the Friday Fictioneers flash fiction forum curated by Rochelle Wisoff-Fields. 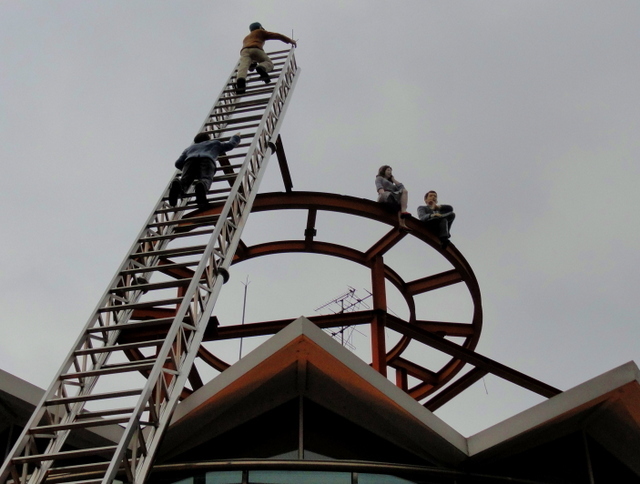 The prompt: a photo of two people climbing a ladder set against a metal framework on which two other people sit. (See the photo prompt, David Stewart’s photo ‘The Rescuers’, here.) The other influence on the above is JG Ballard – hence Jim. The illustration is partly based on the skeleton of the ‘A-bomb Dome’, Hiroshima. To see a list of links to all the responses to this week’s Friday Fictioneers prompt, click here.